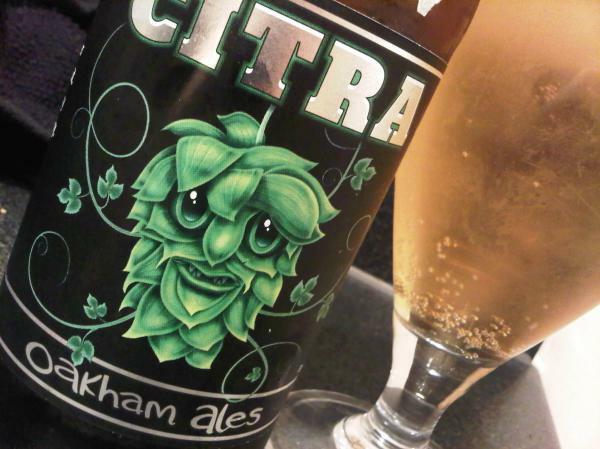 Mark Dredge - Beer: Citra: A-list star to stay or one hit wonder? If Citra hops were human, heat magazine would write about them every week. On other pages you’d see vital statistics comparing them with Nelson Sauvin, showing how the beau of 2010 is outshone by the star of 2011 (they might also point towards rising anitpodean wannabes to watch out for in 2012). It seems that almost everyone is now brewing a beer with Citra in it, but I don’t know if I like the hop that much. Used to give a burst of the juiciest fruit in the world, Citra is delicious and unrivalled, with so much citrus and tropical fruit, but use them in large volumes and the opposite starts to happen with an intense clawing bitterness, a feral sharpness like cat’s piss (of course I’ve tried it, otherwise how could I legitimately tell you it tastes like that...) and often a dirty earthiness, like eating a muddy mango. I’ve also had a couple of Citra beers which have been unmistakeable thanks to a lime flavour jutting through the middle. Lime is ok, it adds a poke of fragrant citrus to a beer, but the trouble I’ve found is that it’s so intense that my tongue thinks it’s going to taste sour and instead along comes bitterness. It’s confusing, it’s challenging and it’s also a little bit weird. Fyne Ales' Jarl is the best example of using Citra that I’ve tasted. Some others come close, including Oakham’s, but there’s also a niggling dirtiness left at the back of the throat, a rasping kick which makes it very clear that this is a product of the earth, and it’s that which I don’t like much. Is Citra the king of the kettle or a one hit wonder to be quickly replaced with something new? what about brewdog IPA is Dead Citra? I'm a massive fan, thought you were two? Is the Citra Fan Club dispanding before it even begun!? jokes aside though, it is a great Hop for IPA's especially. or isn’t it the case that we’re in the middle of a hop arms race as new and novel hops with even more intense character emerge almost on a monthly basis to general acclaim — isn’t galaxy the next one to rhapsodise about or have I missed that one? I have to say I love the Oakham Citra, looking back to your last post about regular beer this is usually on somewhere in our town and I would always take it as a safe bet. I do get where you are coming from though as some of these high hop, high strength IPA's can be bloody awful after half a pint.. I think Citra is the clearest example of the extreme hop sport that's currently dominating British brewing. I can't help feeling that the balance of British beer is leaning too far this way, and the balance of malt and hop being lost in this headlong sprint for citrusy hop rush. Like an orchestra with only violins - you need some double basses, cellos and bassoons in there too, courtesy of some underpinning nutty or biscuity malt. I hope citra sticks around a while as I've yet to taste a beer made with it. ATJ - Galaxy is next, I hear, until some other brusque young thing bursts onto the scenes, no doubt. Beersay - I love hops in my beer and I especially love good IPAs, there's just something in Citra which is very distinctive, similarly with Nelson Sauvin. Christopher - I know what you mean and it's a product of the US influence on British beers. I like beers with lots of hops in but only if they've got an element of drinkability in them which makes me want to go back for more and more, which is where the balance comes in - these hops, as they are so powerfully flavoured, definitely require a delicate balancing act. Ed - You've quite possibly had one without realising - it's being used a lot! You should order some and brew a beer to see what it's like for yourself! I think the consideration should not be given just to Citra, but to all beers that could quickly become passé if brewers try too hard to replicate another beer. You can't move for Citra, single hopped IPAs, coffee beers - most of which are either being outshone, or their tastes are being lost in the memory of others. I like some citra beers, but not all that i've tried. Does that mean i'm now hesitant of trying more, simply because of the hop? Am i alone in that thought - and will the past 6 months must drink hop sit on the shelves, in the casks/kegs longer because of it? A lack of imagination will be the downfall of a hop or style, rather than the hop itself. Being a proper HopHead, I really enjoy beer made with this hop. Call it a fad or standby, I think that it is here to stay. Like any hop or other beer ingredient, it is possible to over use it. The current trendiness is sort of causing that now. I definitely agree with other commenters that it is possible to overdo it with this flavor powerhouse. Looking beyond the trend and its current overuse, I will continue to favor beer made with it. Galaxy the next one? Then I'm glad I got my Galaxy Single Hop Pale Ale out of the way in late 2009 (without becoming a trend setter :D). Nice hop though! Juicy! I do like a nice Citra beer, but the important thing is that Brewers make a good range of beers, and publicans stock a good range of beer styles, so you can have the choice one way or t'other when you visit the pub. I forgot to mention Brodies Citra. At 3.1% it's a great beer! Chris - Maybe there's something in the idea that many of these beers start as one-offs? The ones which are the best are the ones which are enduring on as regular brews (Fyne, Oakham, etc). skoenemann - Let's just hope there's enough of a harvest to keep up with the demand! I heard that there might be a massive shortage of Citra next year but can't remember when or where I heard that! Barry - Yes, I noticed that Torpedo is now using Citra. It didn't originally, did it? Or did I just miss that?! And Galaxy is a goodun'. I tried Thornbridge's Galaxia last week and it's definitely juicy! I think Citra's role in single hopped IPAs might be a short time gig, but I think it will easily move onto hop pairings in beer, and brewers trying to pair the hop with another or many other hops to make more great beer. Citra is here to stay, just on the shelf with all the others. Brimstage uses Citra in Trapper's Hat which is an excellent beer and far from being one-dimensional. My favourite beers containing Citra so far are Summer Wine Diablo and Hawkshead Windermere Pale. I know Diablo pairs Citra with, I think, Centennial and I suspect Windermere Pale isn't a single hop either. There are a few other beers that I like which I suspect might contain Citra in the mix, but won't embarrass myself. I seem to recall you fawning over a cingle hop Citra beer we tasted out of the tanks at Bear Republic. Give me Cascade, Nelson, Amarillo or Bramling X anyday (just my personal op) - although I have yet to try Oakham's Citra. Kernel's was excellent, but I just find the hop a little one-dimensional. Still, new hops bring new horizons, don't they. I have yet to try a commercial beer brewed with Citra, though I suspect I had a homebrew that used them. Anyway I have Citra hops to use next time I brew an APA so I am curious to see how my cats take to it. @Birkonian - Hi Steve, Brimstage Trapper's Hat doesn't contain Citra, but our Sandpiper does (along with other hops).